Many thanks for the tape covering George Arthur's comments on L&H - appreciate very much YOUR GENEROUS GESTURE & certainly very nice of you - again my thanks Bob. Am returning your tape on which I made a recording of the L&H theme music, made in London eng. in 1932 - thought you'd like to have this in your L&H collection - also added some excerpts from old records of the early days of of the Music Halls you might find interesting - I recall seeing these artistes singing these songs just before I came to this Country in 1910. Again my kindest & bestest to you & yours. George K. Arthur (1899-1985) was an English actor who won an Academy Award for Best Short Film in 1956 for the film The Bespoke Overcoat. In the late 1920s he was partnered with Karl Dane as part of a comedic duo named “Dane & Arthur.” Dane & Arthur appeared in The Hollywood Revue of 1929, which featured Stan Laurel and Oliver Hardy as inept magicians. Keep well - continued happiness & success. Just mailed you a letter & publicity material from an Advertising Agency - re using a picture of L&H in connection with some insurance Co. magazine ads & making offer for permission. Thought best you decide on this. Thanks yours, 7th.inst. the description of your recording equipment is most interesting - thats quite a 'Lay-Out' - fully understand your ability to record George Arthur comments - note you tape all the L&H soundtracks - I have in the past had several of these sent to me but I frankly am not too enthusiastic, it may be OK for those who are familiar with the particular action in the films otherwise most of the dialogue & sound effects are senseless - to be more explicit I guess I just do'nt care for them Period. Note you are stuck with your 8mm sound idea - its pretty difficult - not too practical. re availability of L&H films - I correspond with several collectors who have libraries of 90 odd films in 8mm & 16mm silent & sound - one I know has 16 silent 8mm. Yes, a film on the career of L&H has been discussed several times by several producers - but the project never materialized - I understand it was a CASTING problem. Re my likes in Music: I prefer old time popular songs & music (nostalgic type) do'nt care for Classics & such. Al Jolson biography will be wonderful, so many great song numbers - No, I never did meet him. Think thats all - glad you like the recording old English music Hall records, those I taped from records - most of my stuff is on tape - as soon as I can borrow another recorder I'll copy some more for you - English & American vaudeville era. 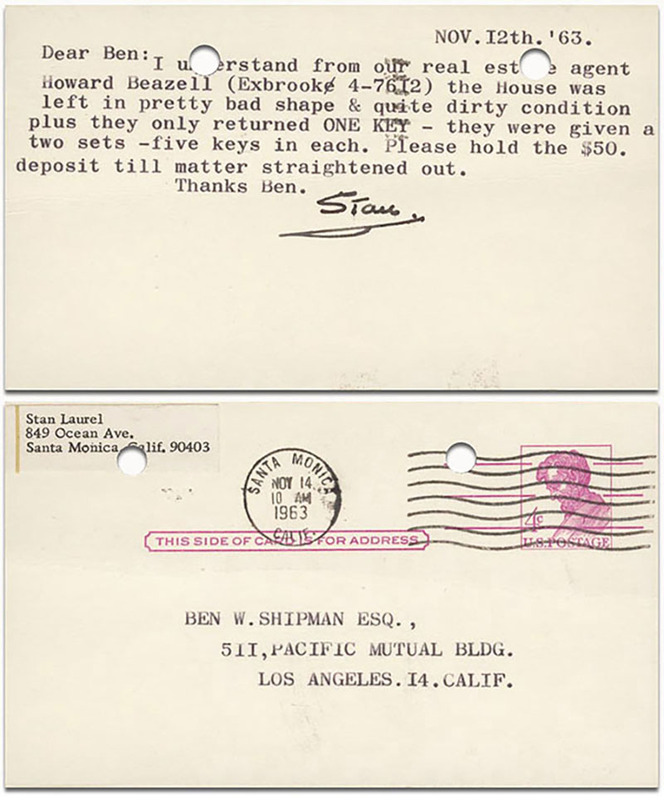 I understand from our real estate agent Howard Beazell (Exbrook 4-7612) the House was left in pretty bad shape & quite dirty condition plus they only returned ONE KEY - they were given two sets - five keys in each. Please hold the $50. deposit till matter straightened out. Thanks Olive [Karno], yours,7th.inst. Appreciate your kind concern - at the time I was requested to make a tape recording for broadcast on "This is your Life" (Harry Worth program) i was not feeling too good - I occasionally have 'bad' days, so its not alarming. Note you have been under the weather with Flu - pleased to know full recovery is in sight. Not much new to tell you Olive, so bye for now. Kindest & bestest to you all from us both here. Harry Worth (1917-1989) was an award winning English comedy actor and comedian. 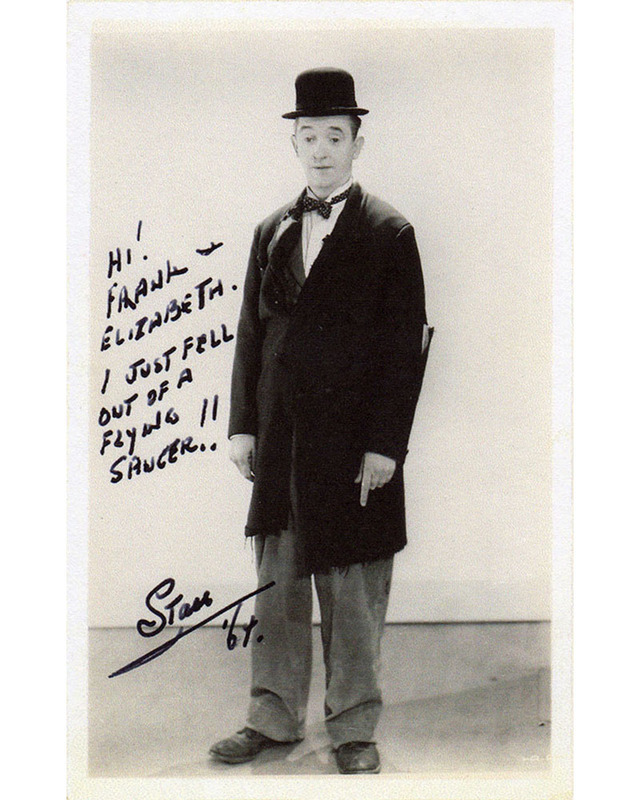 He joined Laurel and Hardy on tour in England in 1952. The Placque you mention was presented to L&H on "This is your Life" program in 1954. The Pool at the Roach Studio was being named Lake L&H. This was not the pool used in "The Music Box" film. Re Mr Harmon acquired the Right to use the names & characters of L&H for use in merchandising & Animated cartoons, in which we receive royalties - monthly payments & percentages outside of this we have no control. Edgar Kennedy died several years ago. Re my directing or producing films - I am not physically able to get around or able to engage in anything strenuous. Am sure you knew I was forced into retirement due to suffering a stroke in '55. Sorry I have no picture other than what I already sent you sometime ago. Just a few more stamps - mostly domestic. Eda joins in love & bestest to Jim & your sweet self - trust alls well. Thanks [Eric Burkitt] yours,21st.ult. At the time I was requested to express my good wishes (Tape recording) to be broadcast on the This is Your Life program honoring Harry Worth, I was indisposed & unable - pleased to tell you I am feeling much better. Mr Worth, appeared on several variety bills with Mr Hardy & I during our tour in 1953. My kindest & bestest to Mrs Burkitt & Self. Herewith the correspondence from MR STOCKMAN - London, Eng. P.S. Thanks Ben for the wonderful picture of Frank Fouce - its excellent. Frank Fouce (1899-1962) started out as a child actor. He later worked for Bronco Billy Anderson, where he directed the short, When Knights Were Cold starring Stan Laurel. I'll take this opportunity to wish you all - Happy Thanksgiving - also a very Merry Xmas, Continued good health, success and happiness in 1964. Thanks yours [Dean Kaner], 24th.inst. I too wish you & yours, a very happy Thanksgiving. The untimely death of our dear late president was indeed a great tragedy for this Nation - in fact the whole World. I hope & pray that President Johnson will make effort to 'CARRY ON' in the same manner as J.F.K. - God Bless him. John Fitzgerald Kennedy (1917-1963), was the youngest man ever elected president of the United States, and the youngest ever to die in office. He was shot to death on Nov. 22, 1963 at the age of 46, after two years and 10 months as Chief Executive. Kennedy's Vice-President, Lyndon Baines Johnson (L.B.J. ), took the Oath of Office aboard Air Force One the day Kennedy was killed. Thanks your note with enclosure of news photo article. With pleasure I am enclosing you an autographed for "RANDY". Hope you enjoyed a happy Thanksgiving despite the tragic event in Dallas recently. A sad & sickening affair was'nt it.? Thanks yours, [Bill Brown] 25th.inst. - I recd. your recent letters - did'nt acknowledge, figured you'd be out here before this - anyway, note you plan to leave there Dec.7th. - wish you a safe & pleasant trip. We here too were very upset over the tragic death of our beloved president, a sad & sickening affair - Yes, furs are worn out here quite a lot, it can be very cold in the evenings - all types of climate in California. The shock of the tragic death of J.F.K. upset me very much—a sad and sickening affair. A terrible thing to happen to such a wonderful president. We here too were very saddened over the tragic death of our beloved President, a sickening affair. Incredible that such a thing should happen in the U.S. What a loss. Sorry you missed getting the 100 stills - anyway, am sure there will soon be plenty more available, so many were sold to dealers at the Roach Studio auction (in 50,000. lots) no doubt these will all be copied & put on the market. Note re marking the names of supporting cast on the stills you are returning - I'll try & think of the Bulls too - if only their last names.!! The Fat Girl that Ollie eloped with in "Our Wife" film was Jean 'Babe' London - she is now in the Motion Picture Country House - talked with her Thanksgiving Day in fact. Turpins wife - I'd have to see the film again to find out her name - re her calling Ben 'PA' (he was referred to as 'PA' by the whole family & associates) she could have been his daughter - wife or anybody - it was'nt important (could have been the Gal next door.!!) 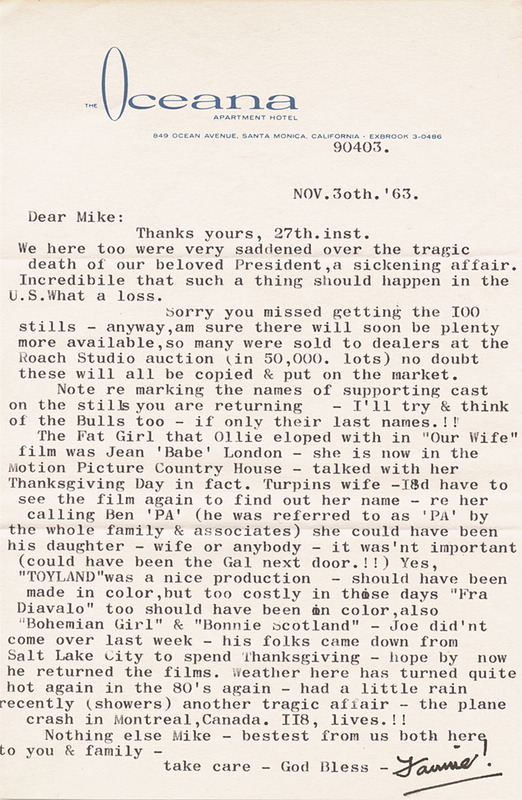 Yes, "TOYLAND" was a nice production - should have been made in color, but too costly in those days "Fra Diavalo" too should have been in color, also "Bohemian Girl" & "Bonnie Scotland" - Joe did'nt come over last week - his folks came down from Salt Lake City to spend Thanksgiving - hope by now he returned the films. Weather here has turned quite hot again in the 80's again - had a little rain recently (showers) another tragic affair - the plane crash in Montreal, Canada. 118, lives.!! Trans-Canada Air Lines Flight 831 crashed about 20 miles north of Montreal on November 29, 1963, killing all 118 people on board. The crash was the deadliest in Canadian history at that time, and is still the third-deadliest in Canada. 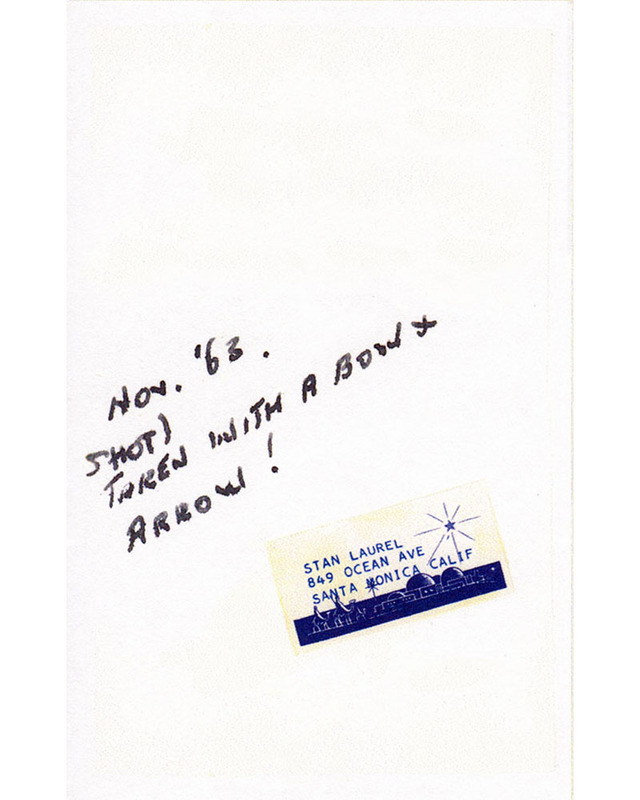 Stan signed this letter “FANNIE,” which we assume was an inside joke with his good friend Mike Polacek.